Does anyone else have days when they could just eat a whole packet of chocolate digestives? I certainly do, when I’m tired, William is cranky and I feel deserving of a treat I often feel like reaching for the biscuit tin. There are two major problems with this though. firstly, my biscuit tin actually doesn’t exist, I try not to buy food like biscuits or crisps as having them in the house means I would eat them! Secondly, a whole packet of chocolate digestives, great though it sounds, really never feels like a treat afterwards. I don’t ever deny myself food, and I hate reading terms such as ‘guilt-free’ or worse, the dreaded slimming world term ‘syn’. Food isn’t something to feel guilty about, and it certainly isn’t a sin. I think its really upsetting that people feel this way about food; for me, all food, healthy and not-so healthy, is something to be savoured and enjoyed, not labelled. Having said this, I do enjoy eating healthily and love nothing more than being able to create delicious treats that provide some nutritional benefit as well as calories. The packet of digestives really doesn’t provide any nutritional value and for me this is what makes them not such a great choice. I also get far more pleasure eating something if I have made it myself, it feels more deserving. This week has been incredibly busy with renovations in the barn. We are supposed to be moving into it by September and at the moment its a building site! Progress is being made, but as with all building projects, delays creep in. This is also the first renovation project we have undertaken whilst having William. It is making it much harder for me to help out as at the moment its not safe enough to let Will crawl around in. I have been trying to get some jobs done in the evening, once my husband is in to babysit. By 9 o’clock I’m ready to drop and love nothing more than a biscuit and a big ol’ cuppa! These biscuits certainly fit the bill! They are crunchy around the edge with a slight cookie chew in the middle, and are so tasty. To make them suitable for babies I have modified a recipe that was given to me years ago. 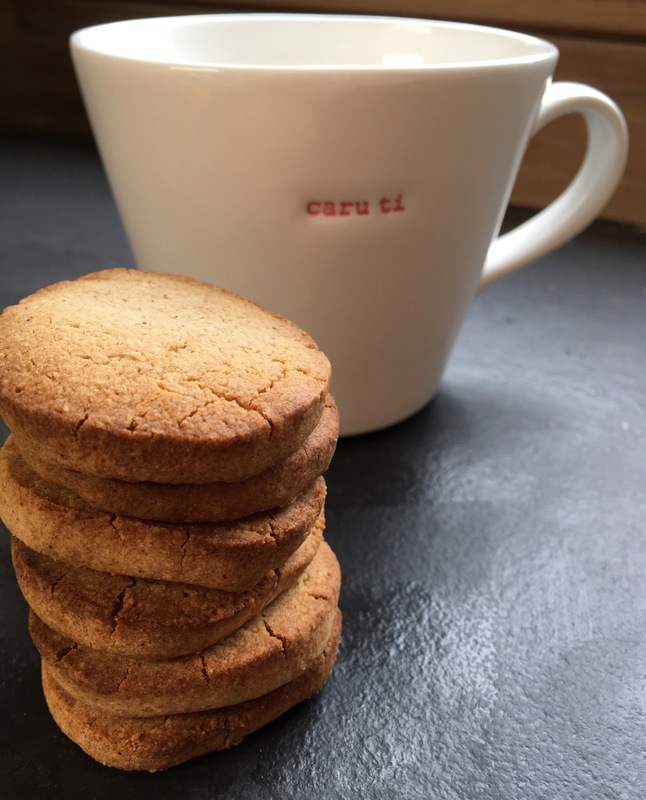 They are free of refined sugar, gluten and dairy, but none of this impacts the flavour, they taste just lovely and due to the nuts and buckwheat they are healthier than a standard biscuit. Buckwheat is related to rhubarb and is a complete protein, while nuts are a great source of vitamin E and healthy fats, brilliant for growing little ones. 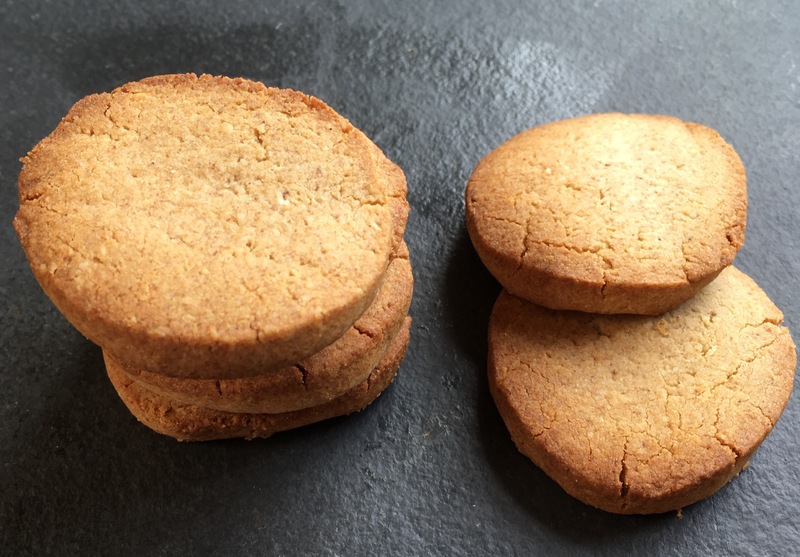 They are fast to make and cook in 10 minutes so they are easy to whip up when the need for a biscuity treat strikes. I’m still not suggesting you eat the lot in one go though! 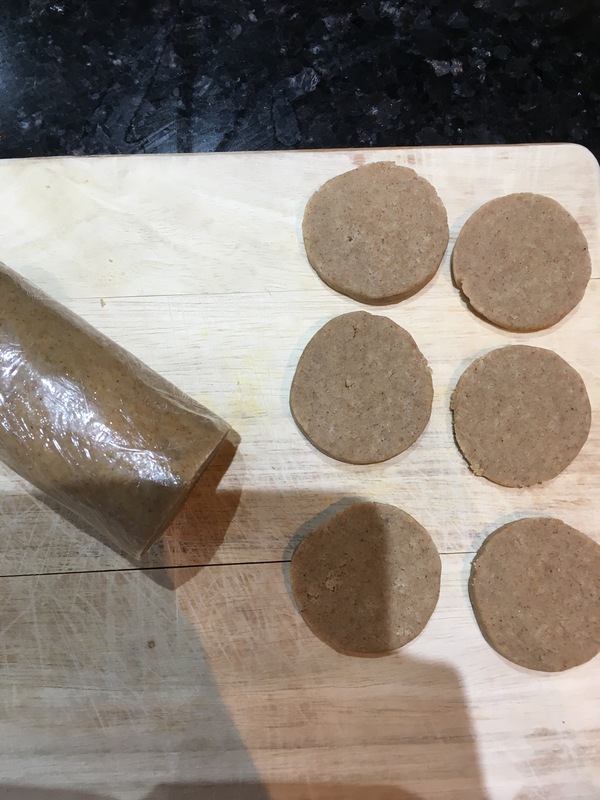 Bake for 8-10 minutes at 180 C. The biscuits should be golden and firming up with a little softness in the middle. Leave to cool on their baking tray.